Thank you very much for your assistance in this matter. Your opinion letter may become enough to prevent a trial. Does he travel outside California to testify? Yes, often. If you have a potential forgery problem, or a disputed document, we can help. The Document Examiners on this site are pre-screened qualified professionals who can detect forgeries, identify anonymous writing, authenticate documents, and stand firm on the witness stand to help your case. 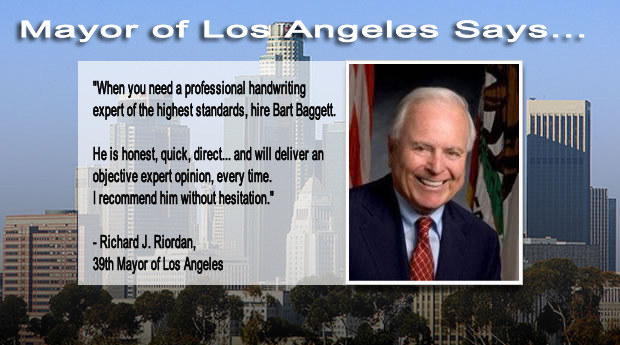 Bart Baggett is one of the nation’s most recognized Forensic Handwriting Experts in the world. 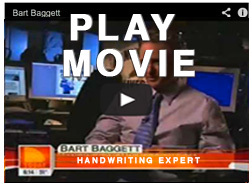 He is ranked #1 by Google as America's #1 Handwriting Expert and has appeared on more radio and TV shows than any other living or dead handwriting expert in the history of the world. directly or through his network of peers and associates in other states and countries. Our document examiners' rates are 60% less than industry averages. Plus... you won't pay a HUGE upfront retainer. You can talk to us before you pay a dime. We want repeat business and value our client relationships. Many of our experts are nationally known for commentary of such shows as Larry King Live, Fox News, Court TV, and The Today Show on NBC. Call our office with questions, or a referral.